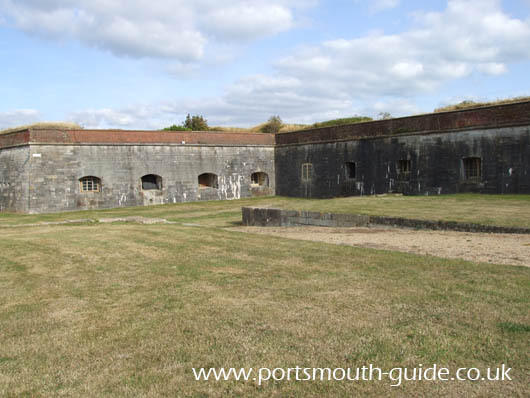 Fort Cumberland is located on the south eastern corner of Portsmouth. It was built to control the entrance to Langstone Harbour and to improve the defences of Portsmouth Dockyard. An earthwork battery was built on Eastney Point to defend access to Langstone Harbour by 1716. Work began on a new Fort in 1747 and this first fort was star shaped. The second Fort Cumberland was pentagonal in shape with projecting defensive earthworks and was built mainly of brick and Portland limestone and it was the last bastion-traced fort to be built. The fort was completed in 1812 with the Guardhouse and Storehouse being retained from the first fort. Fort Cumberland featured vaulted casemates within the curtain wall and the stores, men and powder were moved to the relative safety of the curtain wall. In 1858 Fort Cumberland was transferred from the War Department to the Board of Admiralty and in 1859 the fort became the temporary headquarters of the Royal Marine Artillery. The 1861 Royal Commission assessing barracks and accommodation lead to the construction of further buildings around the fort and to the modification of other buildings. During the twentieth century the fort was home to the Royal Marine Artillery Howiitzer and Anti-Aircraft Brigade. In 1964 the fort became a scheduled Ancient Monument and after the Royal Marines vacated it in 1975 it was taken into Guardianship. It is now home to the English Heritage’s Centre for Archaeology and is only open to the public on special occasions such as during the Festival of British Archaeology or Heritage Open Days. For more information about Fort Cumberland and details of when it is open to the public have a look at historicengland.org.uk/about/contact-us/national-offices/fort-cumberland.